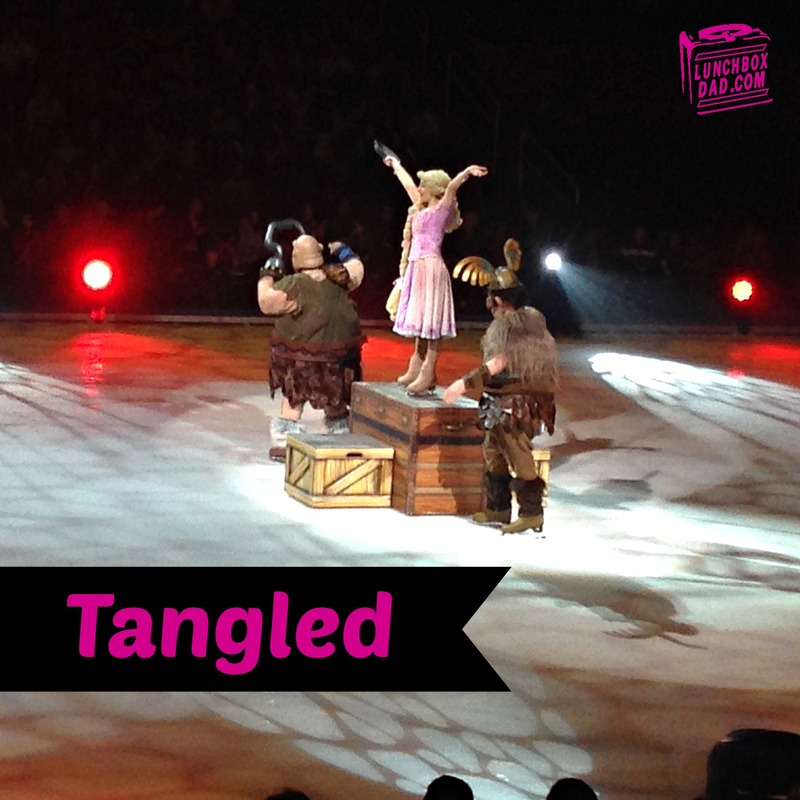 Lunchbox Dad: Review: Is "Disney On Ice Rockin' Ever After" A Show Your Whole Family Will Love? 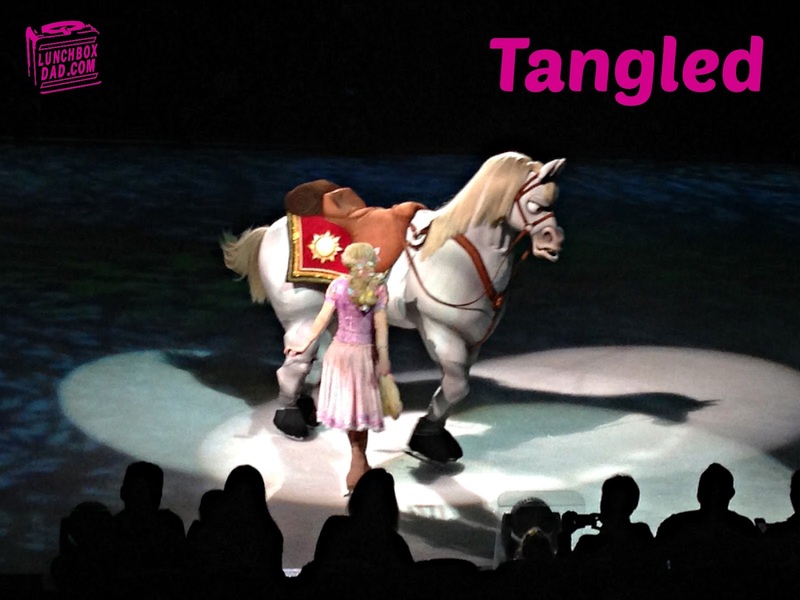 Review: Is "Disney On Ice Rockin' Ever After" A Show Your Whole Family Will Love? Disney On Ice is touring the country and there happened to be some stops where I live here in the San Francisco Bay Area. I had the opportunity to take my family for the first time to the SAP Center in San Jose to experience the Rockin' Ever After tour. Here at Lunchbox Dad I always review products and experiences from a whole family's point of view. So you will see if Disney On Ice is worth your hard earned dollars. Whenever attending an event such as this, I recommend arriving early. Fortunately the SAP Center has easy parking and we were able to find a spot and get to the door in no time at all. Before long, my family and I were wading through the halls looking for our section. Here's a handy tip, don't forget to use the bathroom before you go to your seats, you don't want to miss any of the show. 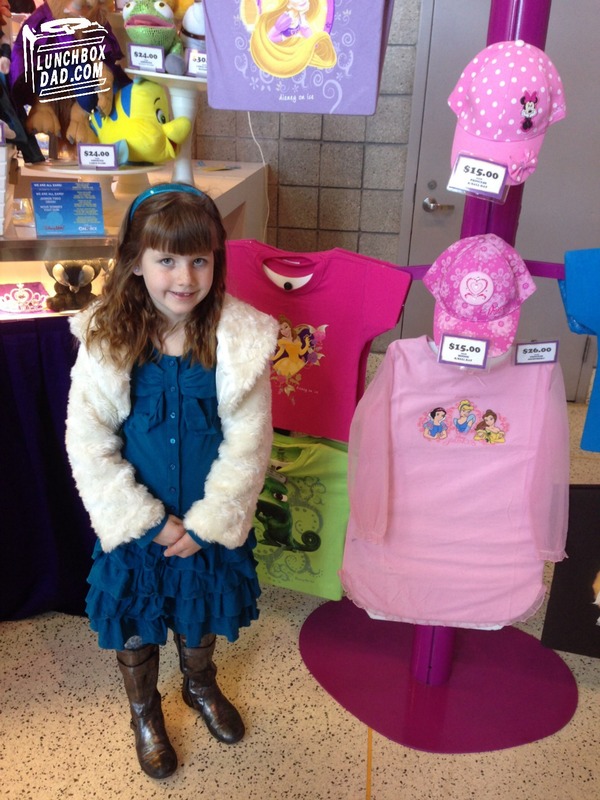 One of the first things you will notice at this Disney On Ice event is the merchandise and concession booths. They actually have some pretty cool stuff but if you want to invest in toys or shirts find a booth at the end. Every station has the same merchandise and the end booths will be less crowded. The prices are fairly expensive, but not any more than what you would find at your typical ball game or similar special event. The selection includes princess gear, as well as shirts with characters such as Maximus from Tangled, so both your girls and boys will be begging for it. We found our seats in plenty of time and were immediately impressed with the setup. My kids were very excited because we didn't tell them what we were doing, we just surprised them when we left in the morning. There were many kids dressed up in their Disney best so don't be afraid to get your children into the spirit of the event. The show itself started off in typical Disney fashion with an appearance from Mickey and Minnie mouse, as well as a few other assorted characters. It was a good warm up number but my kids were ready to see the main parts of the show. There were four sections of the program and each section summarized the story of one Disney princess. 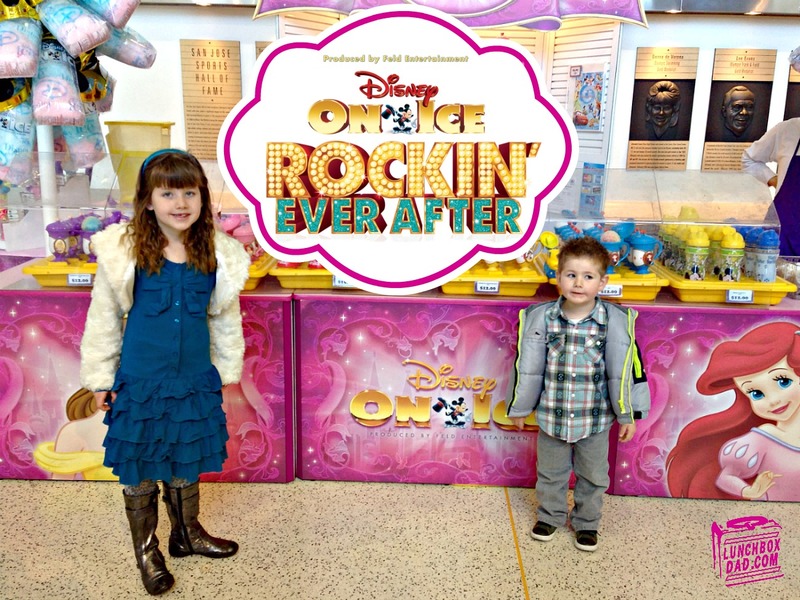 I do have to say my kids were really hoping to see FROZEN characters, but I'm sure Feld Entertainment, the creators of Rockin' Ever After, will include them next year. FROZEN is way too big of a hit and I'm guessing that the movie was released too late to capitalize on it for this year's ice show. The Little Mermaid was next and Ariel did not disappoint. The whole routine was extremely impressive. The costumes and design were eye catching. For my wife and I, our favorite part was the "Under the Sea" performance. You really have to see it to appreciate the effects and lighting. I have to admit that I am not a figure skating fan, but throughout the morning I was constantly awed at the amount of talent it took these professionals to skate, fly through the air, and act. The Little Mermaid was a tremendous example of that. The skater who played Ariel, Kristin Cowan, was amazing. She not only skated well, but also did an acrobatic rope trick that was unexpected and thrilling. The next act featured the characters of Tangled. Obviously this is a popular one, because of the recent hit movie, and my kids would tell you this was their favorite. After the high flying Little Mermaid, this was a bit different. The skaters did well but this portion of the program didn't stand out for me as much. That is with one exception. The character Maximus the horse was hilarious! The costume was spot on and the two skaters inside did a fabulous job moving as one. While my kids loved Rapunzel and Flynn Rider, Maximus was the highlight for me. 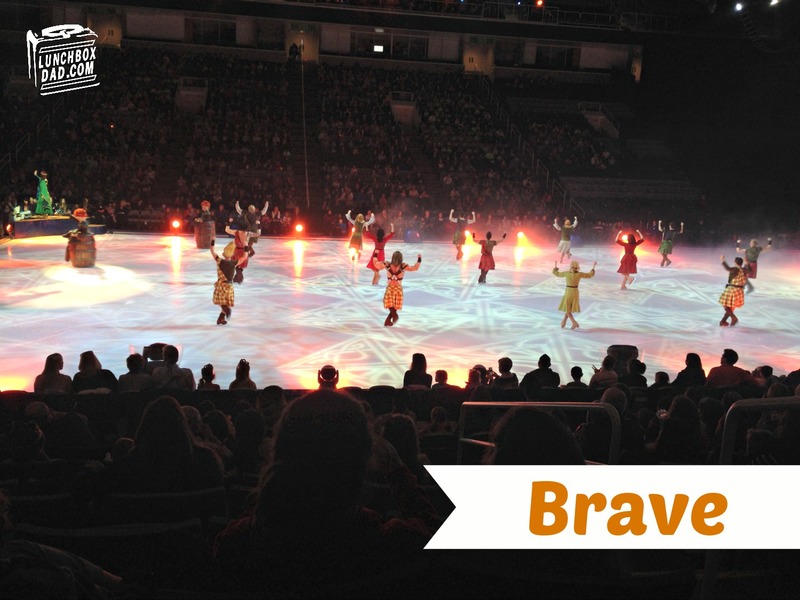 After a needed intermission the show was back with an appearance from Brave. One thing to stop and mention is that although we love Disney movies, they can be scary in parts. Rockin' Ever After did a good job of including most villains, but not making it too frightening for smaller children. The bears from Brave were not included and I imagine it was because the directors felt it was too scary. However, the actress who played Merida did a fine job and my wife was astonished at how much she looked like the actual character from the movie. Even though I haven't seen the movie myself, it was easy to follow along with the story and the costumes for Merida's brothers were pretty funny. I won't give away what they were, you will just have to see the show. 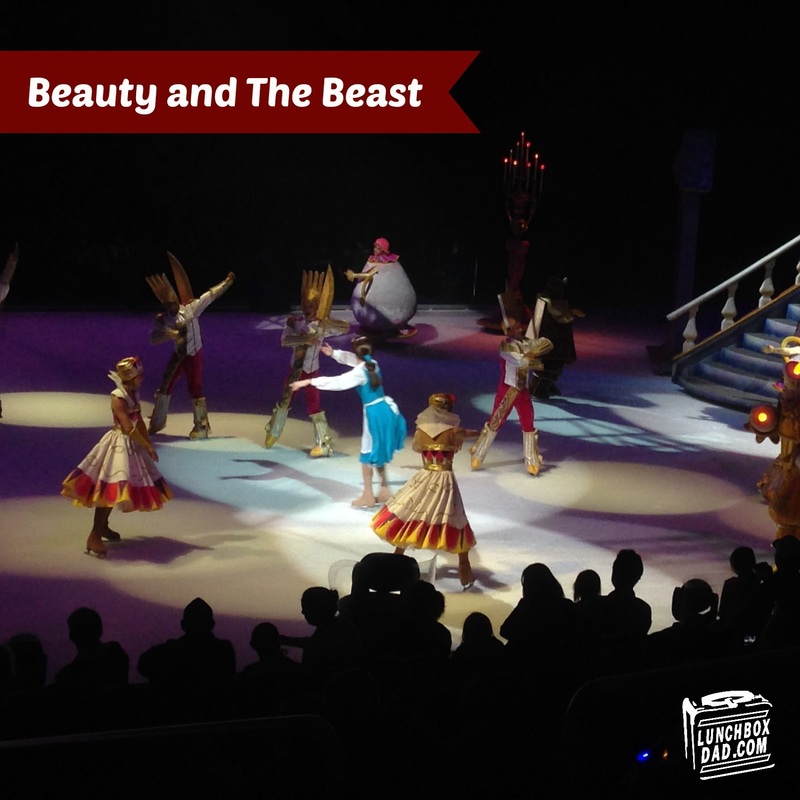 The last portion of the program featured the story of Beauty and the Beast. Along with the "Under the Sea" performance from earlier, this section contained our favorite time of the morning. "Be Our Guest" is obviously one of the most beloved songs from the movie and the production behind this part was superb. There was so much going on, and from the costumes to the set, it represented the movie well. My kids definitely came out of their shell and sang along for this number. I also have to mention here the actor who played Gaston. He was hands down the all around most entertaining male in the show. He was expressive, funny, and really drew you in. I know this is a review and I'm supposed to tell you both good and bad, but as far as the actual performance goes, it was too impressive to be negative. The only drawback for some might be the price of merchandise and food, but it's what you expect from a show like this. As adults, we enjoyed the pageantry and athleticism. There wasn't one mistake and the fun factor was high. However, the main point is to entertain the kids so the deciding factor should be what they thought. My son and daughter both gave it two thumbs up and would excitedly go again. I would highly recommend you attending Disney On Ice Rockin' Ever After if it comes near you. The show will be in San Jose until Feb. 23, 2014 and in Oakland from Feb. 26-March 2. You can check www.disneyonice.com for more tourstops and go to www.ticketmaster.com to get your tickets. Disclosure: Feld Entertainment gave me tickets to review this show. I have received no other compensation for this post and the opinions I’m expressing here are solely my own.